You have to go down one of the tiny back alleyways to enter the ancient Indra Chowk. 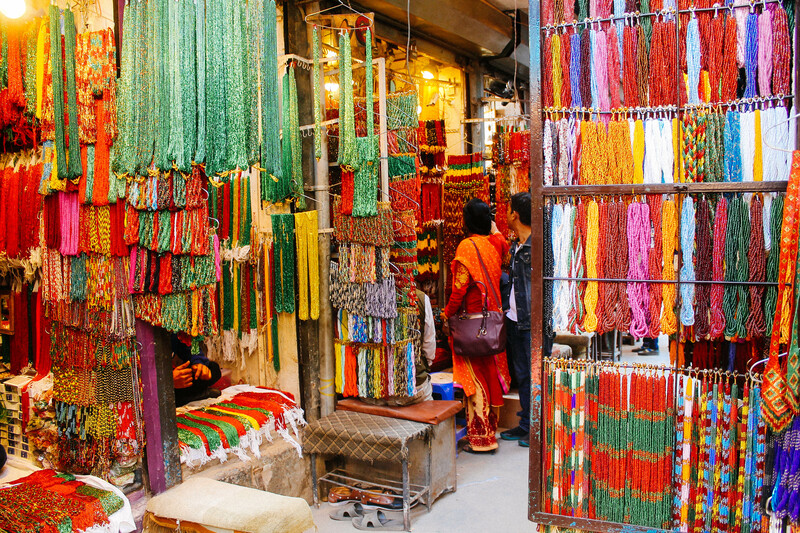 You wouldn’t expect a small brick passage to lead you into such a large colorful world of sparkling beads, but hidden between the Hindu temples is a world unique and beautiful to explore. 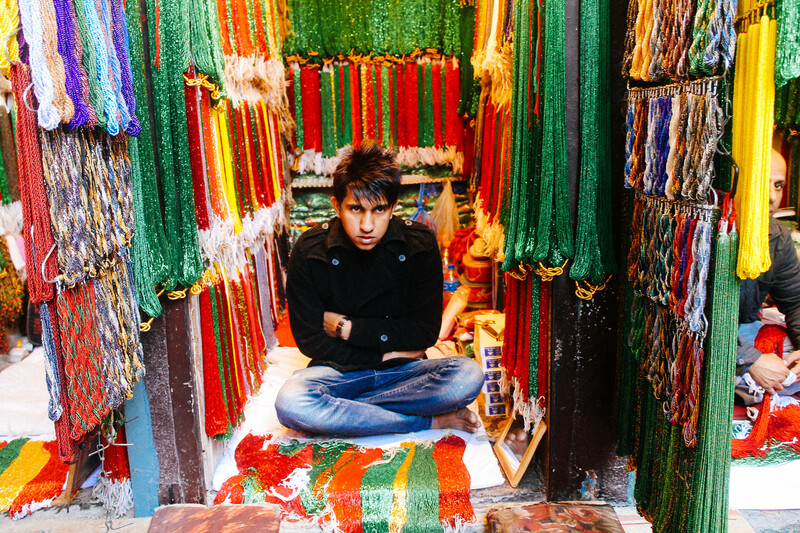 There are lines and lines of tiny stalls, about four by four in size, holding rows of beads with the owner sitting cross-legged somewhere in the middle. 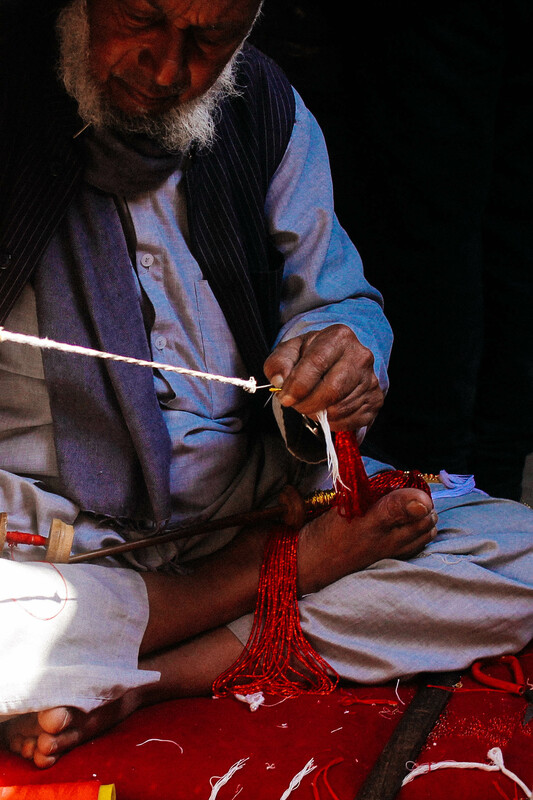 The men’s hands work swiftly, stringing tiny beads into long rows. 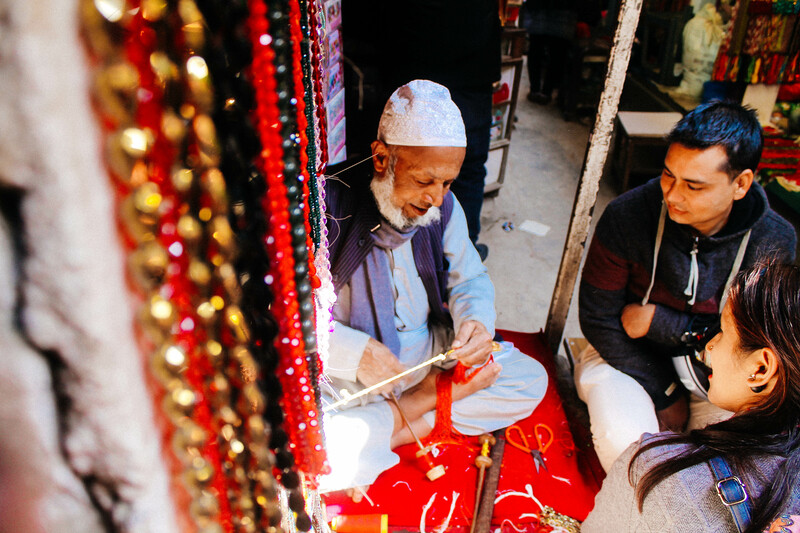 Years of working in this trade, skills passed down from one generation to the next, has helped keep Nepali traditions alive for decades. 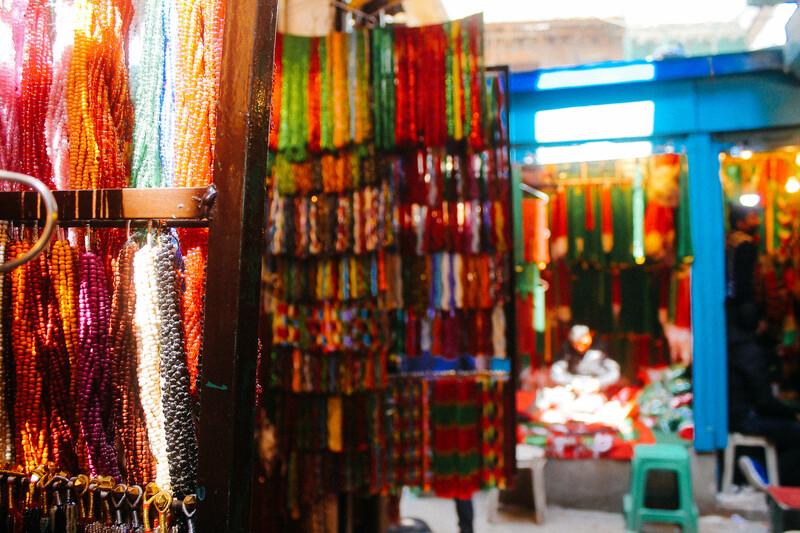 In Nepal, these beads tell so much about a woman’s status even in today’s more modern culture. Many of these beads are used as necklaces to signify marriage, spiritual symbolism, or significant life experiences. Red, Green, and Yellow is the primary traditional colors. Many women include large gold pendants on their necklaces to show their family wealth. 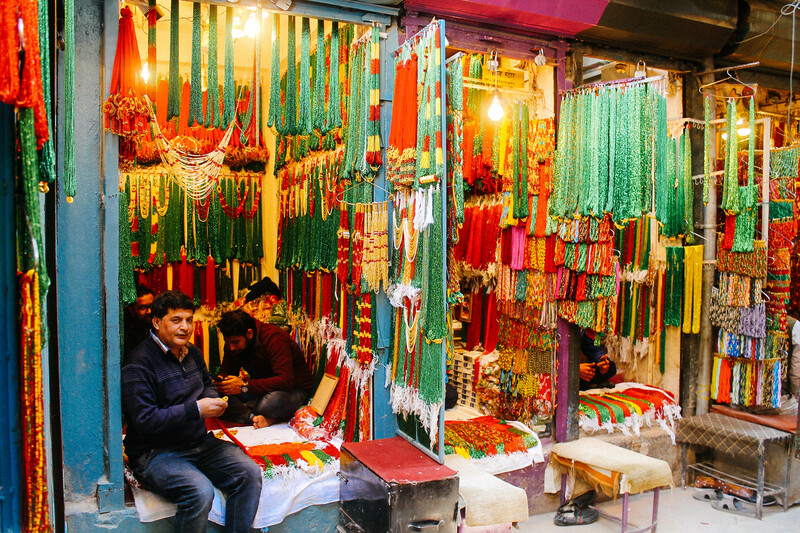 The market is bustling with people, mostly local buyers but always a few tourists enjoying the colorful Nepali art. There is lots of laughing and joking between the vendors and buyers. Most of them sharing a cup of tea and a cigarette, you can tell they enjoy the socializing market life affords. Many young boys hang around, learning from their fathers what they will need to know before they open a stall of their own. This bead market is a place of tradition and community, a place for people to come together and enjoy a culture completely their own. 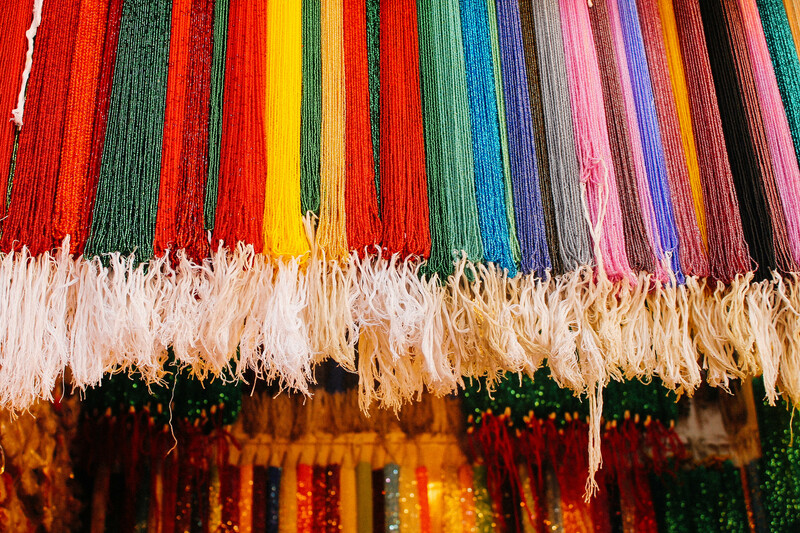 As the years pass the traditions may change and the bead trade may not be as widespread but today it stands to represent a piece of the Nepali culture that remains untouched by time.